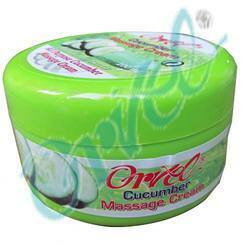 Pioneers in the industry, we offer cucumber massage cream from India. Cucumber Massage Cream is soft, light, cool cream goes beyond massaging and provides visible firmer smoother skin. Advance formula which combines with natural vegetable extracts like Cucumber, Turmeric, Lemon, Red Sandalwood, Tetumool, Nagarmotha, Liquorice, Ambehalad and Daruhalad which lightens skin and dark spots resulting in fairer and radiant skin. Especially good for oily skin and summer conditions. Looking for Face Massage Cream ?